World maps will be posted here. Copied from the Ubox thread. Heres my ideas for the border redrawing and region naming. Tierra Salvaje is wildlands (wilderness, untamed wilds, you know) in Spanish. Initially I tried to make two separate areas with a border on the natural divide where you had origionally put the yellow line, but I couldn't think of a good way to name the two areas, so I just made them as one. 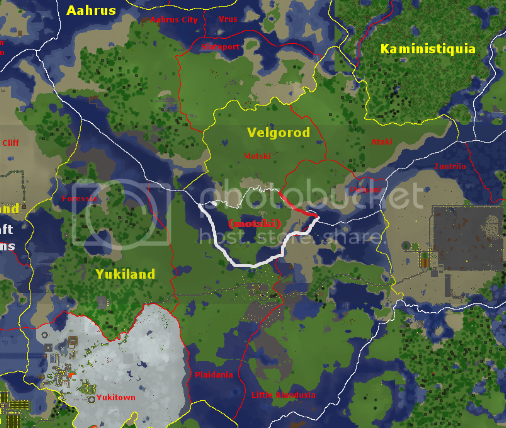 I don't think there should be a state for "The Emrate Steads of Testificate", but there can be a greater region containing that area and stretching further north and east to the other borders, and it could be called Enod Stead and be a part of the UBSR managed by you if you develop it. South Riverfield, I assume is the municipality name and not a region name? If so, ok.
Abbreviations cannot be in municipality names, so in Old Amazonis, the municipalities would have to be "Aeridanish Old Amazonis" and "Bielosian Old Amazonis". Smjjames was thinking of using another name than Amazonis, so maybe you might want to call it something else than Old Amazonis though? Smjjames approved, will hopefully be in the next map. I won't include the tentative names, though... I think. I've kind of settled on and like Amazonis, so stick with that, and Jungle Cove will do unless someone has a better suggestion. The tentative bit was just a note since I wasn't sure about keeping those names at that time. Also, the testificate state is based on the idea of having the area around it be a neutral territory. Okay... Could South Riverfield be a municipality instead of a region? Okay. Name the region Arcevvi Mountains then. Bla this is the general blan of my region. You can just call it Darvwnse-a if you find the official name too long. Also if you find Ikxlaxwv wv Swmpkex too large of a municipality you can use the smaller ones too. I meant for Swmpkex and Ikxlaxwv to be the alternates, and the Ikxlaxwv wv Swmpkex is both Swmpkex and Ikxlaxwv is if you decide that it is small enough for a municipality/province. Enjoy the creativity of the world mapping program. Idk what caused the error. 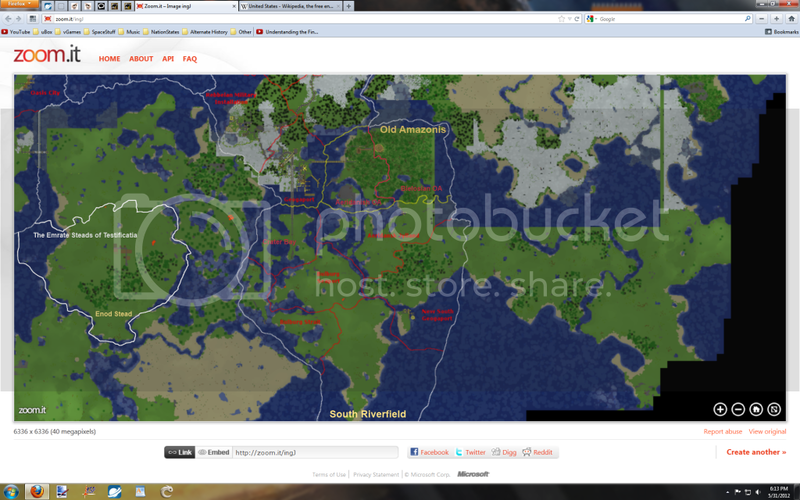 So far I'll make a policy of only showing 5km from the center on the map, otherwise GIMP becomes extremely demused. Currently, there's nothing of interest outside 5km anyway. I could set the Borderguard limit to 5km, or I could just decide not to include those areas in the map I upload. Quontex found a mushroom island... And I also spotted the edge of another mushroom island somewhere in the western ocean on the map. Yay finally a mushroom island. Quontex, do you remember the coords? Whoever's territroy it's in, may I build a small hut with LOTZ of bowls? Look at the map. I don't know the coordinates either, but if you go straight west from around the middle of the swamp that is just north of Kaeshar, you'll reach it eventually. It's a kilometer+ from the nearest claimed land. 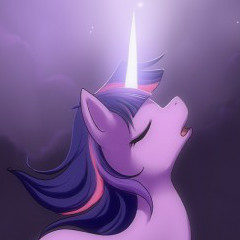 Besides, it's just been discovered (recently anyway) and nobody has claimed it, so you're free to build what you wish. I haven't heard anything about Quontex claiming the island. I explored the ocean out west, found those scattered islands, does that mean I claimed them? no. Scattered islands are common, mushroom islands aren't. Idk how he would react if you built on it, but he discovered it, and you can see the edge of another mushroom island on the map. Use that one if you want to build if you don't want to ask Quontex. You can still visit the one Quontex discovered. Okok. Also, just wondering, has anyone found a extreme mountain biome yet? I found something 109 blocks high, but it only spanned like 20-30 blocks. How come you're looking for one specifically? The mountains in Kaeshar may have previously been or contained an extreme mountain biome, or at least extreme hills. 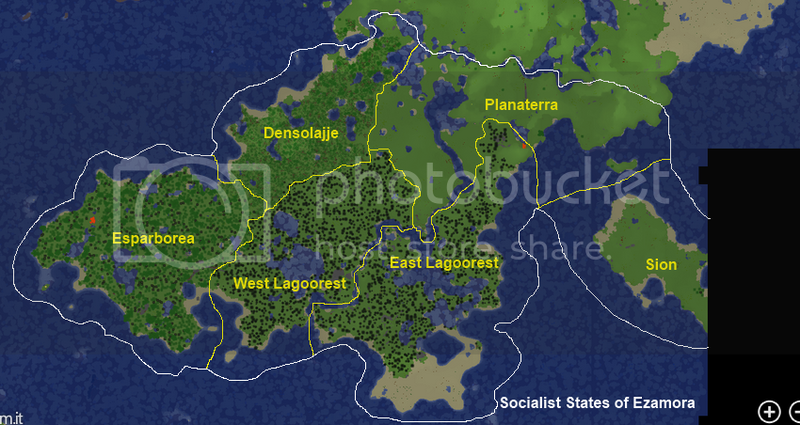 I will make a region there some time, but it will be bigger, contain the entire swamp and border Quonbla. bla can you remake vinelandar if yu removed it. Remember to name Yqtprovince "Ogoki". Where Capital is Capital + Avhrus. I'm expanding my territory. Here's the map of where I am going to do so. If there seems to any overlap between my territory and Ninjaworld, then that is a mistake I made in photoshop. Bong: Is that small territory in between for me? Thx, i'll claim it. Agree? Oh I'd like to add one more small thing. I'd like to rename Mojikit to Mojikit Stronghold. Thanks. With all the new people, the risk of people stealing land I actually want was brought up to me. So, why not double the size of my territory? Everything in the above posts. New region, Verslest (Vers l'est; to east), Hecla becomes falaises extreme. Might as well post this for Fiah. Also, Bla if you read this before I bug you about it on Steam, there is an argument over the ownership of the last unclaimed stronghold. While it's not heated, most of us want you to take it. 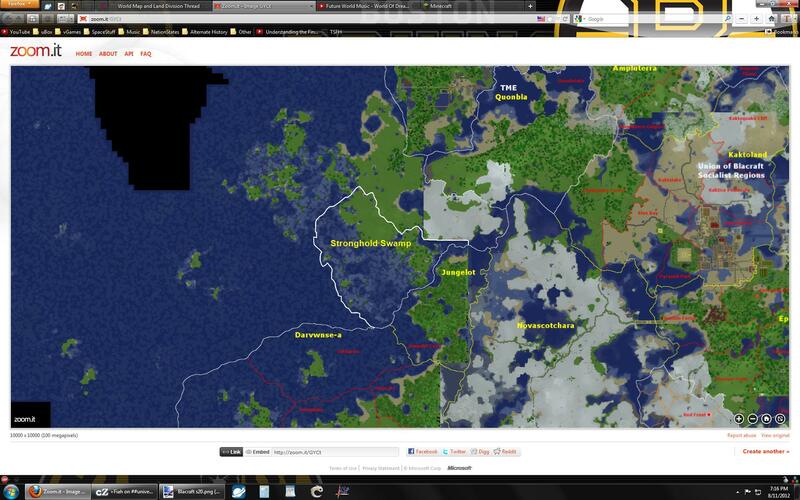 Just putting this here since it's a bit of territorial expansion and I've already built stuff there. In light of.... recent events..... I have decided to claim the swamps north of Kaeshar. Darv gave Plaidania to Naru. I asked Naru for some of Plaidania that I feel like is my own national territory. We agreed to this. The new territory should be part of Motski. Just remember not to claim territories where you haven't built anything. Claiming areas so that others can't claim them is also a somewhat bad idea I think, then we can quickly get the entire map claimed. Nobody really wants that swamp to the north of Kaeshar anyway Bla. Plus the swamp area is kind of unofficially Kaeshar controlled, just making it official. Also, a warning to you that an expansionist fervor is starting. Works for me as far as claiming land. Yellow is : definite part of Ijky Islands. Ijky Islands is part of Bongatar. I heard some people were complaining about a peninsula they didn't colonize and Rocksolid now building on it. If Rocksolid built on it, it's his. He's also a new player. Give him a chance to get a territory instead of trying to grab the entire world for yourself. If people are getting egoistic on claiming land their claims will simply be ignored. And "nobody wanting an area anyway" is not a valid reason to claim it. Smjjames, I don't have a problem with you taking the swamp, but you should at least find a use for it and utilize it instead of just claiming it. Someone else could find it useful in the future. Explored a whole lot more. The desert place i wanted should be uncovered a lot if the map updates . lol someone graph the area of claimed land in m^2 on the y axis with time on the x axis and it'll be exponential. kip that depends on if it is official. not official, yes. but official? no way. by official i mean Bla saying yes. what that reply makes no sense. Yes I was lazy with the borders. Also me not adding text doesn't mean that I'm forever denying your claim. It just means I didn't add the text. omg omg its converting convertiblas. Thank you very much Bla! I've already said that Jace can have that land if he wanted anyway. Can't say I like the region name "Jace0800" but meh. Thanks Bla! Jace8060 is just temporary to mark that he claimed the land. I don't know what he wants the region to be called, haven't even talked to him about it. Also http://blacraft.wikia.com/wiki/Blacraft was updated because I had 20 random minutes.